COLFinancial Group Inc is the best and leading online brokerage firm in the Philippines. Their growth is really amazing. Congratulations Sir Edward Lee and your team. According to Sir Conrado F. Bate, they can grow easily by another 30-40% this year. That’s a huge increase. I believe in this company. I believe the founder, Sir Edward Lee. I first heard his story from an audio material inside the Truly Rich Club. Bo Sanchez interviewed him and revealed his humble beginning. I like listening on his story from time to time. Edward Lee is an inspiration. "Leading online stockbroker COL Financial Group Inc. is looking to grow its client base to more than 60,000 this year from a little over 46,000 customers in 2012. Growth will be driven by increased investor interest and activity in the well-performing local stock market COL president and chief executive officer Conrado F. Bate said in an interview. “I think we can grow easily by another 30-40 percent this year,” Bate said. Bate said in the next three years, COL hopes to increase its customer base to 100,000, mostly Philippine residents, Bate said. COL wants to take advantage of the robust stock market, which is one of the top performing in Asia. 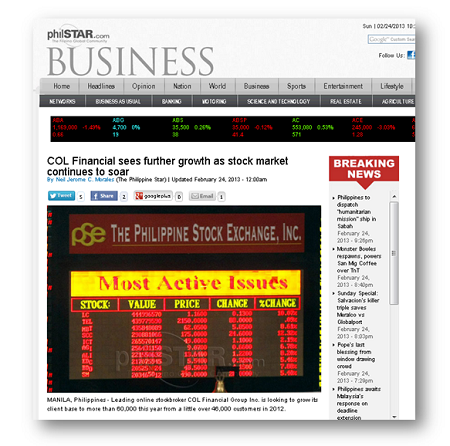 The Philippine Stock Exchange index (PSEi), the barometer of the local bourse’s performance, closed 2012 at 5,812.72. Since then the bellwether index has already climbed 14.66 percent to 6,665.06 as of Friday. The stock market is benefiting from strong macroeconomic fundamentals, higher corporate earnings, increased consumer spending and fund inflows from abroad. Outside of Metro Manila, the online brokerage firm is training its eyes in major cities in the south like Cebu and Davao. “We have a pending application to the Securities and Exchange Commission for the creation of corporate business offices nationwide,” Bate said, adding that the offices will be an avenue for stock market seminars and account opening. COL also caters to high net worth individuals through its Private Clients Group service. Bate said the Private Clients Group, which accounts for 30 percent of the group’s commission-based revenues, will continue to be a significant revenue driver even as it retains its focus on the middle income segment. Consolidated earnings of COL, formerly CitisecOnline.com Inc., declined 7.5 percent to P266.5 million in the nine months to September last year as growth was tempered by the weak performance of its Hong Kong subsidiary. “There is no incentive for investors to increase exposure in Hong Kong,” Bate said, adding that economic prospect there is not as bright as in the Philippines. In the nine-month period, commission revenues from the Philippines rose 19 percent to P300.6 million while consolidated asset base went up 6.3 percent to P3.7 billion. COL’s market share in terms of volume of transactions jumped to 23 percent in the nine-month period from 21 percent a year ago, strengthening its position as the number one stockbroker in the PSE. In value terms, COL remained as the seventh largest stockbroker in the Philippines, handling P111.6 billion worth of transactions."